"Quite exciting, this computer magic." Everyone either owns a computer, or uses them as part of a job, or has been at least exposed to them. Naturally, this gets spiced up for TV land. As a result, computers on TV often bear only superficial resemblance to their real life counterparts. In fact, they are often just a 21st-century substitute for magic. A Computer Wizard is a literal wizard. Evoking arcane words with their keyboard, they cast spells into the infinite (and physically real) realms of Cyberspace. 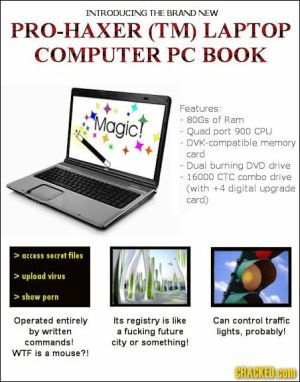 For computers which are literally magical see Magitek. Pages in category "Magical Computer"